This guest post was written by Tom Mela, Senior Project Director at Massachusetts Advocates for Children (MAC). The post was originally published on the National Opportunity to Learn blog, and is reprinted in this blog with the permission of Tom Mela. State House when Chapter 222 was passed. Though Massachusetts’ public schools rank near the top of schools nationwide, they still struggle to ensure that students are treated fairly in the classroom. In Massachusetts and across the nation, students of color and students with disabilities still face higher suspensions and expulsions rates than their counterparts, often for similar, minor misbehavior. But starting this year, Massachusetts is taking a bold step to change that. The new Chapter 222 law, which went into effect July 1, puts Massachusetts at the forefront of a nationwide movement to reduce the use of out-of-school exclusions and provide those students who are barred temporarily from the classroom access to the resources they need to keep up with their studies. It has taken years of organizing to get to this point. Massachusetts Advocates for Children is funded through the state’s civil legal aid system to convene the Education Law Task Force (ELTF), a coalition of public interest legal organizations with expertise in education law. To help advocates in other states learn how they, too, might tackle the school-to-prison pipeline, here’s how our Massachusetts coalition came together, fought hard, and won reform. As part of a major education reform act in the mid-1990s, Massachusetts enacted laws to empower school principals to exclude students from school for disciplinary reasons. These laws were part of a national push towards “zero-tolerance” discipline policies. But rather than make schools safer, the result was that the number of excluded students increased significantly. Advocates became concerned about principals’ use of zero tolerance, and especially the policy’s disproportionate impact on students of color and students with disabilities. When a student is barred from the classroom, it increases the likelihood that they might fall behind, drop out and become involved in the juvenile justice system, making exclusions a big contributor to our nation’s pervasive achievement gaps and the school-to-prison pipeline. In response, a group of advocates including parents, students, teachers and attorneys in Massachusetts came together to form the ELTF. 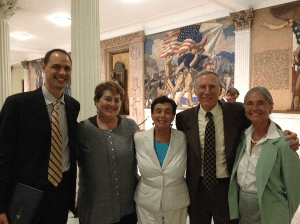 They found a legislative champion in Rep. Alice Wolf of Cambridge, and together they drafted and filed legislation to reform the Massachusetts school discipline laws. For years their efforts to enact such legislation were stymied by the associations that represent principals, superintendents and school committees, who denied there was a problem and argued that in the interest of school safety (during the “Columbine” era) building administrators should have broad discretion to prevent potential harm to the school. In the meantime, education reform in Massachusetts began to address the needs of those students who were at high risk of failure. When the Legislature established the Graduation and Dropout Prevention and Recovery Commission in 2008, one of the main question addressed was whether school exclusion contributes to school dropout. School exclusion was becoming a national issue as officials in other states and even the federal government began recognizing the link between suspensions/expulsions and dropout rates. Members of the ELTF testified to the Commission, and the Commission’s final report recommended school discipline reform. Immediately after Mitchell Chester arrived in Massachusetts in 2008 to become its Department of Elementary & Secondary Education (DESE) Commissioner, the ELTF informed him about the discipline problem in this state. He was particularly shocked to learn that excluded students were not entitled to alternative education services. As a result, the legislation was revised and re-filed by Rep. Wolf and others in 2011, and, with the support of the legislative leadership, was enacted minutes before midnight on the final day of the session in 2012. Many members and associates of the ELTF had testified at the legislative hearing, and they signed a letter to the governor urging his approval. Governor Patrick signed Chapter 222 on August 6, 2012. All public schools, including charter schools, must comply and revise their policies to assure that exclusion is a last resort and that alternatives to exclusion are tried first. During both short-term and long-term exclusions, students have the right to make academic progress. During long-term exclusions, students must be provided alternative education services. Except for very serious offenses, students may not be excluded for more than 90 school days. Schools must review their school exclusion data and increase their reporting to DESE. DESE must post annual state-wide exclusion data each fall. DESE must analyze the annual exclusion data and follow-up when the numbers are high and when there are significant disparities by race and for students with disabilities. To help with the implementation of Chapter 222 (especially for the requirement that excluded students be provided with alternative education services) the ELTF monitored a cost study and worked to ensure funding. In early July 2014, Governor Patrick signed the Fiscal Year 2015 Massachusetts Budget, which includes funds specifically to help schools implement Chapter 222. Though the new law did not to take effect until July 1, 2014, soon after it passed in 2012 the Superintendent of the Boston Public Schools expressed an interest in immediately revising the city’s Code of Conduct before the start of the 2013-2014 school year. The ELTF collaborated with the district’s Code of Conduct Advisory Committee (COCAC) and worked intensively to align the revisions to the code with the requirements of Chapter 222. The Boston School Committee approved those changes during the summer of 2013. Now that the law’s regulations have been put in place, the ELTF is revisiting the Boston code with school officials to make sure it remains aligned. During the period between the enactment of the law and when it went into effect this July, Chapter 222 required DESE to issue implementing regulations. The ELTF submitted draft regulations, submitted “Public Comments,” and testified to the Board of Elementary & Secondary Education. At the end of April 2014, the board issued its final implementing regulations, which the ELTF found satisfactory. The ELTF plans to monitor compliance with Chapter 222 and its regulations at the local, district and state levels. Members of the ELTF will also continue to collaborate with COCAC by representing families of city’s students facing school exclusion and by monitoring citywide school data. The ELTF remains available to consult with school reform advocates throughout the country. Chapter 222 constitutes a dramatic change in law and policy for all Massachusetts public school students. Fewer students will be excluded from school, struggle and drop out, and more students will thrive, graduate and go on to become strong, productive members of our Commonwealth.